Is there a better alternative to Pick and Learn? Is Pick and Learn really the best app in Teaching Tools category? Will Pick and Learn work good on macOS 10.13.4? 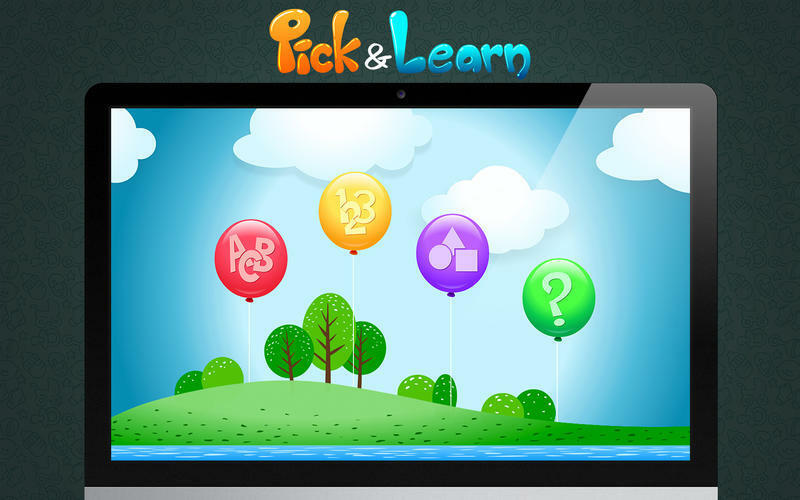 Pick and Learn has been designed for kids who are 2 to 5 years old. It shows up a series of alphabets or numbers on an engaging animated layout. Any one of the alphabets or numbers will be missing in that series. Kids need to pick up the correct alphabets or numbers from the given options that matches the series. This is how it becomes a great tool for children to learn about ABC and 123. The app is divided into four parts. Each part is dedicated to ABC, 123, Shapes and Random. Catchy background music and easy voice instructions for kids. Pick and Learn needs a review. Be the first to review this app and get the discussion started! Pick and Learn needs a rating. Be the first to rate this app and get the discussion started! Engaging graphic animations that will attract kids and help them learn more. This is a fun educational app for your kids that they will love using. Pick And Learn will definitely be your child’s favorite toy and at the same time it will make a strong base in their day to day learning.